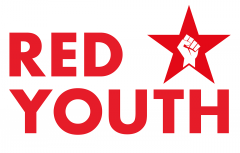 Vice’s Gavin Haynes, who gets awfully excited by the sight of communist flags, rushed to our London picket yesterday to interview Red Youth & CPGB-ML members, later publishing a piece of what he thinks passes as serious journalism. Gavin isn’t the only deluded would-be journalist in town. Whilst British imperialism ramps up the propaganda war against Russia and clearly makes moves to counter the growing popularity of the main television channel which presents an alternative view of the world, the Stop the War movement in this country sent its top peace envoy Chris Nineham to Birmingham. A meeting in the town hall addressed by Chris (an itinerant Trot currently jobbing at the Counterfire rag) was witness to lots of the usual hypocritical “Stop the War Coalition doesn’t take sides”, “we want everyone to stop bombing” tripe. Has Nineham forgot so soon the shameful days when a Syrian nun Mother Agnes was barred from the platform for being a “mouthpiece of the regime”? Nauseating public school trots don’t take sides comrades. “I am a veteran of Afghanistan, I was in the British army for nearly four years, and the intention of the Stop the War Coalition is commendable, the intention to stop an invasion of Iraq was the right thing to do in 2003, for the people of Iraq, for the people of the Middle East and for the members of our armed forces too. People and soldiers needlessly killed – my accusation today is that the Chilcot report is a part of an autopsy of a failed effort to stop the war. All the marches, the million people mobilized, the talks, the leaflets… completely failed to stop that invasion, and ever since those methods have failed to stop the bombing of Syria, the bombing of Libya, and so on. “I have been on these anti-war and anti-austerity marches where we hire speakers, poets, and have the most wonderful festival atmosphere. But as we have seen, these efforts have never stopped any war (or austerity) and as the second speaker tonight mentioned, there seems to be an amnesia of the history of the last 15 years. The anti-war movement seems to also suffer from this amnesia. The amnesia of the tactics tried before, tactics that have unequivocally failed to stop any war. Might I add that our armed forces are bombing across the Middle East right now, while Corbyn sits in parliament as leader of the opposition, and you all think it the most glorious achievement. Corbyn left the vote on intervention, just a few months ago, as an open one to the parliamentary Labour Party, a party that Tony Blair once led. Tony Blair was not the only member of the Labour Party of 2003 who sat on those green benches whilst millions were blown to hell. “What will the Stop the War Coalition do differently to take us forwards and not back? Will Stop the War demand workers to refuse to support the machinery that conducts war? Mobilizing dockworkers, blockading key transport routes, asking munitions workers to go on strike, or surrounding Whitehall and occupying those spaces? It seems as though some are incapable of learning the lessons of history, stuck as they are in the politics they learnt at University in the 1970’s. Fortunately this is a diminishing crowd and the future is most certainly with the youth. Hands off Russia, Hands off Russia Today! Previous Previous post: PROTEST TODAY! 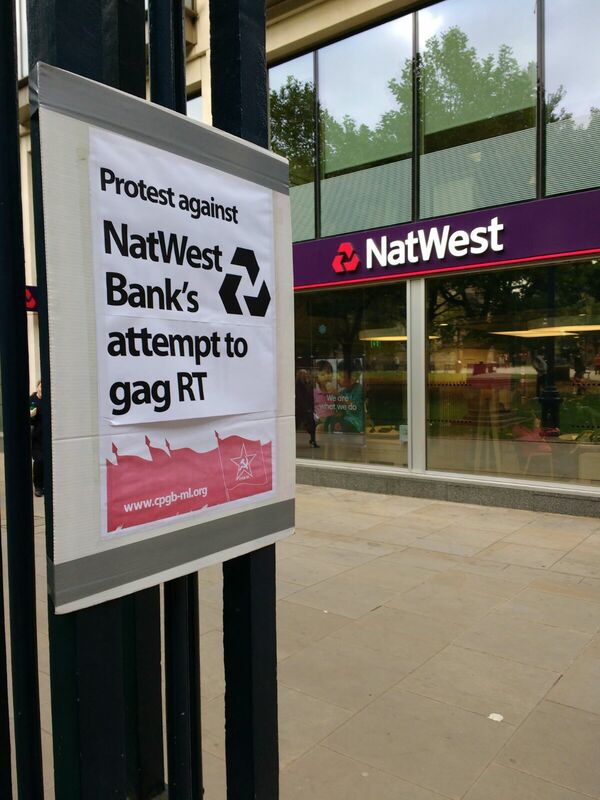 Don’t let NatWest bank gag RT -YOU are the intended victim of a misinformation campaign!